Turns out that Salad comes from the Latin “salata” from sal or “salty” and that was first likely a part of the cuisine in the 14th century. Then Shakespeare in 1606 mentioned one’s “salad days” as a time of “youthful inexperience” and that seems inexplicable because I think of salty as experienced and seasoned. Don’t you? I also read that the Babylonians started dressing greens about 2,000 years ago, but in America we had little interest until after the Civil War. What followed was the German invasion with their Hot Potato Salad and the Shakers with Fruit Salad and then finally in the 1880’s, what we think of as green salad became a part of the menu. But salad today can be anything thrown together in a bowl. I’ve already shared the “Meat Salad” we served at Mirage and at the Stagedoor Café. There were two other favorites I’m now prepared to reveal, simply because we will most likely never have another restaurant, thank the Lord, and because I think they were such special favorites that it is only fair. Our Chicken Wonton Salad, like the Taco Salad, came a bit ahead of the popular versions which are endemic now. And not to brag, but like the Taco Salad, I think it is a better version of the now popular favorite. I’ve never given it out before – but here it is! Whip together until sugar dissolves. Cut won ton wrappers into strips. Deep fry in oil for a few minutes until wontons are golden brown. Drain on paper towels. Along with sandwiches as a “side”, we always served a good potato salad or a choice of the above. I say Aunt Verna, but I think it actually came from her sister Anne. 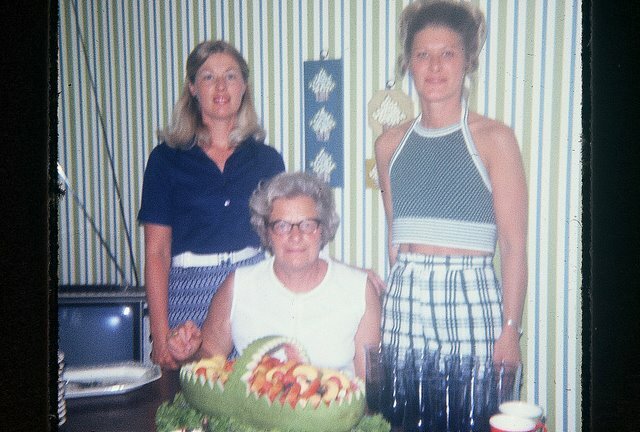 The picture at the top is of Aunt Verna and my cousins Marlene and Maryanne, and I believe that the fruit salad in the cut-out watermelon may have actually been Marlene’s contribution. But the Norwegian Cabbage salad has been a fixture, not only in our restaurants of the past, but for large family get-to-gethers, for it is a winner and easy to make and will keep without much refrigeration, making it handy to make ahead and especially if you have other dishes that need extra care and coddling. Trust me – this salad will be an old standby before you know it. Mix together in large bowl or pot, cabbage, pepper, onions and salt and pepper. Bring to a roiling boil the oil and vinegar, sugar and celery seed over high heat. Pour hot dressing over vegetables, toss to coat and wilt and let stand a few hours to season. Drain, if need be, before serving. Will keep at least 9 days – longer if refrigerated. The fruit salad shown in the photo from our 1970’s trip to Minneapolis is easy to reproduce if you have a good sharp knife and an easy hand. I like to add a splash of lemon or lime to my fruit compote and toss it with honey and cinnamon – to taste. I keep adding and tasting until it is just sweet/spicy right. Bon Appetit. Or rather, I should say – Takk For Maten! Where are you finding the photos?? They are a riot! This one was taken in my kitchen. I am still using the glasses in the photo everyday. Where in heavens name are you finding those pictures? Marlene and I just about cracked up when we saw that one, where did I find such an outfit? You are truly bringing so much enjoyment to me with these wonderful posts, such good memories of such fun times! Keep on posting, I will keep enjoying!